This is a happy plate of food. There is something about the colours and all the spirally noodles intertwining on the plate, speckled with dots of red, black and green that makes you feel cheerful. And it smells pretty fantastic too! 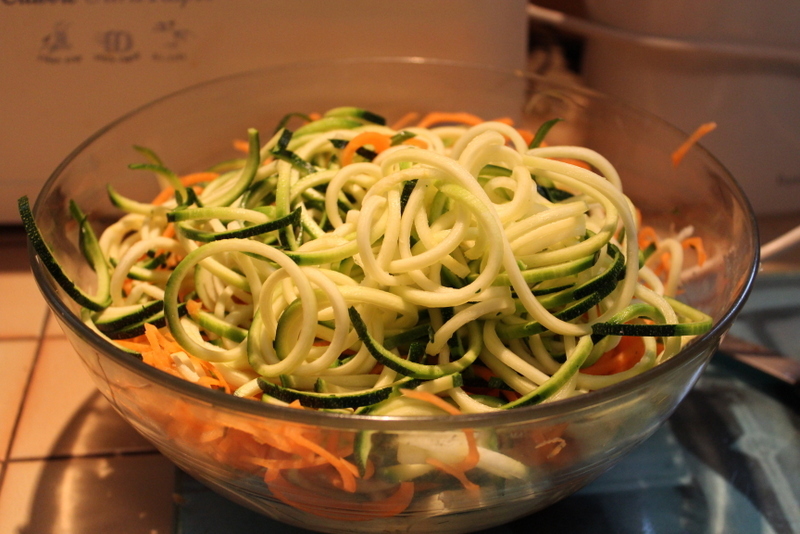 I must tell you I am a little in love with my Vegetable Spiralizer . It is truly a clever bit of kit. This recipe came about as a result of an urge to use it, just a need for a dish with the gorgeous twirly whirly spaghetti that it makes. I got my kids involved and they happily wound the handle round and round, in spite of the mini melt down that occurred over who would do the carrot and who the courgette! As always at the end, you are left with a hugely appetising bowl of vivid vegetable joy. I decided to make a warm dressing based on the idea of a sauce vierge. A little olive oil, lemon juice, garlic, tomatoes, black olives, a dash of white wine vinegar and heaps of chopped fresh basil. Topped with warm griddled chicken and sprinkled liberally with creamy, salty feta cheese. The aromas were undeniably enticing. This is also healthy, with bright, fresh flavours. It’s a merrily appealing dish that makes you want to sit and eat it outside, bathed in sunshine with lots of lovely crisp white wine. This is one I look forward to making over and over again throughout the Summer. Yes…I am most certainly inspired by my spiralizer. Watch this space for more experiments. Start with the hugely satisfying job of making your noodles. If you don’t have a spiralizer, you could of course make this dish with normal pasta or maybe even use a vegetable peeler to make long strips of vegetables instead. Meanwhile, cook your chicken however you like, I griddled mine. Whilst it is cooking, make the sauce. Take a small pan and add your olive oil and squeeze in the lemon juice. Heat gently. Chop your deseeded tomatoes and add to the pan. Let them heat through for a few minutes and they will soften and enrich the sauce. Season well, add the garlic, black olives and vinegar and continue to heat gently whilst you cook the noodles. Fry your vegetable noodles in a little olive oil with lots of seasoning for around 8 minutes so they are cooked through but retain bite. Remove the sauce from the heat and throw in your chopped fresh basil and then pour over the vegetable noodles and stir them to coat. Arrange the noodles on a platter and crumble over the feta cheese. Top with sliced chicken and serve and seriously enjoy! I am entering this dish into a few blogging challenges. 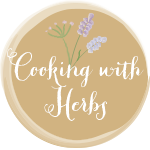 First off, Cooking with Herbs hosted by Karen over at Lavender & Lovage as it is packed full of fragrant fresh basil. 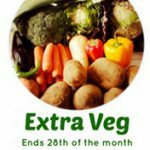 Next up, the Extra Veg challenge hosted alternately by (this month) Helen at Fuss Free Flavours and Michelle from Utterly Scrummy Food for Families. Of course the use of vegetable noodles instead of pasta in this dish fits the brief perfectly. And last but not least, I am popping this into this months Four Seasons Food challenge, hosted by me and alternatively by Louisa from Eat Your Veg. 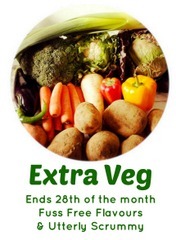 With the theme ‘celebrating vegetables’, this one is just the ticket. 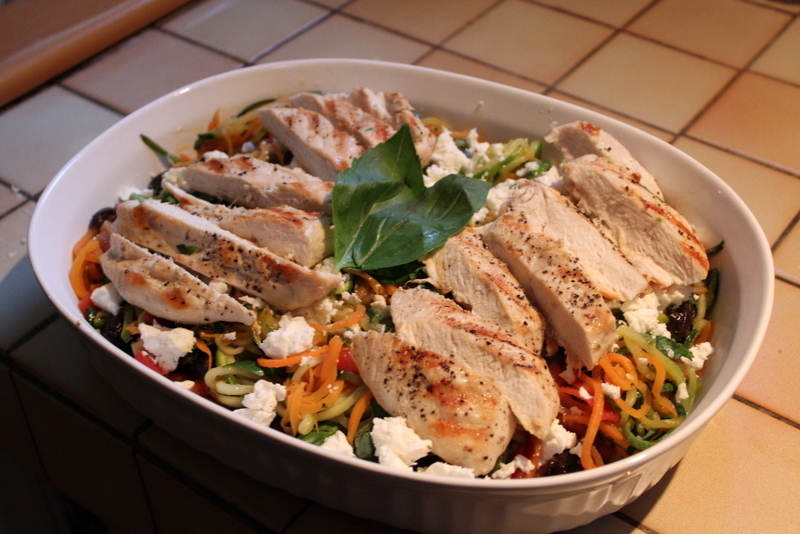 18 Comments on "Grilled Chicken with Vegetable Noodles, Tomatoes, Olives, Basil & Feta"
Gosh Anneli, this looks wonderful. Definitely the food equivalent to the Happy song by Pharrell Williams! Exactly the sort of springy dish I love at this time of year, plenty of veggies, fresh flavours and nice and light. And I’ve quite a bad case of spirilizer envy developing, despite the potential for child meltdown issues. You need this gadget in your life! I really do love mine. I’m planning another adventure with it very soon. It’s very inspiring and the veggies have such a great texture when lightly tossed in a pan. YUM. I’ve said it before & I will say it again…. 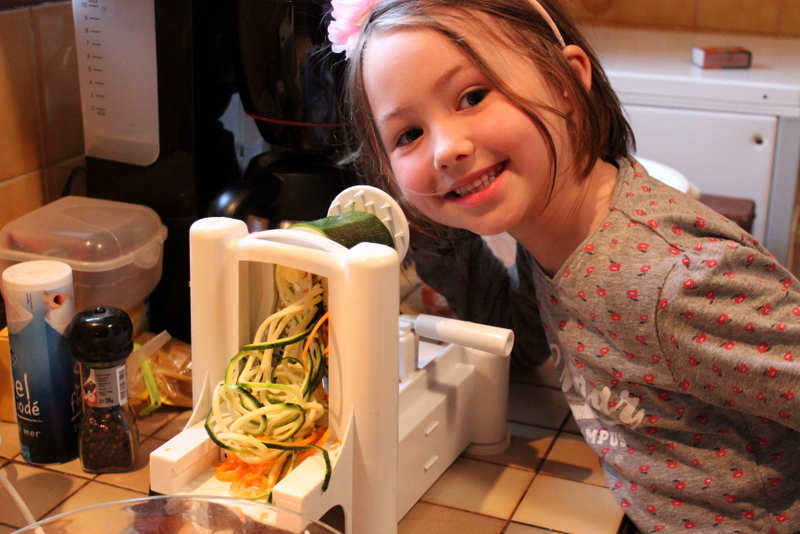 I LOVE your spiralizer! And this dish looks perfect for Spring….. fabulous combination of textures and flavours! I love how this looks and I’m sure that I’d love how it tastes. And I’ve got to add that I just love the word ‘spiralizer’. Thanks Phil. It’s a great word…and a great gadget. Glad you liked it ! Oh Anneli, you are such a bad influence! 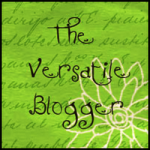 I have just ordered a spiralizer, Having read your blog I decided I couldn’t live without one! Of course, it is a very sensible buy since the courgette season will soon be with us! That’s my excuse and I’m sticking to it!! I would love a spiralizer and can see why you’ll be making this again over the next few months. What a good dish to enjoy that also happens to be pretty virtuous too! It is a pretty healthy dish! I think using vegetables like this really is a great way to inject colour and vitamins into your dishes. Healthy and light…yum. 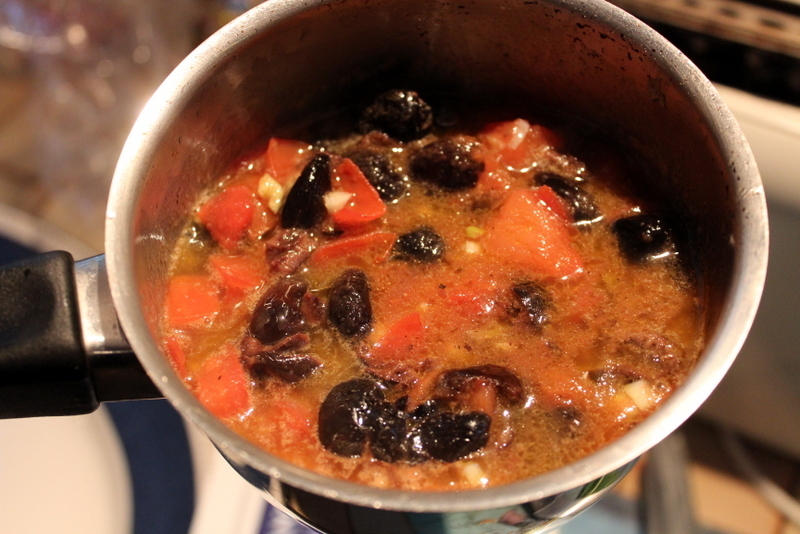 Yum, this recipe ‘reeks’ of Provence with its tomatoes and olives (is Gascony part of Provence)? Your daughter is very cute, she obviously loves to cook! That is a very sophisticated gadget! I have a little hand held one like an ordinary peeler but I love the courgette noodles I can make. Your chicken looks delicious too!